Laurence Gale enjoys a nostalgic trip back to Shrewsbury Rugby Club: Our personal sporting heritage in this country, nearly always starts from our introduction into sport during our schooling days and then more progressively by the good work done by hundreds, if not thousands, of community sports clubs. My own sporting career started in the same way, introduced to rugby by my maths teacher Mr Williams. After leaving school I joined the Woodrush Old Boys team club, Woodrush RFC, a community club run by ex-players and volunteers. As a keen rugby player who went on to represent school, club and county levels, cumulating in the opportunity of playing for several senior clubs, namely, Moseley, Worcester, Birmingham, and Nuneaton, Portsmouth and Newport enabled me to play with some great players and more importantly enjoy the benefits of belonging to a community run rugby club. After my playing days, I coached rugby at several clubs and recognise the valuable work these clubs do for their local community. Also, having spent 45 plus years working in the grounds industry as a ex-Greenkeeper/Groundsman coupled with my coaching roles I value the benefits of producing safe well, presented playing surfaces. In the past it has often been difficult to encourage clubs to invest money and resources to maintain their pitches however, since the formation of the National Lottery in 1994, we are seeing a vast improvement in the investment in pitch and club facilities. 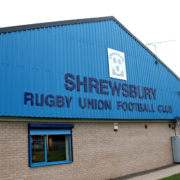 A recent trip to Shrewsbury Rugby Club, where I incidentally coached in 2004-2006, gave me a chance to catch up with some old familiar faces and have a few beers. I was very impressed with the condition and presentation of the pitches at Shrewsbury. In fact, they were some of the best community pitches I had seen for several years. I was so impressed I wanted to find out how the club had managed to achieves this major shift in attitude towards their pitch facilities. Like most community clubs they are always run by a core group of committed individuals, often past players, who want to put something back. Shrewsbury have one such man in Glyn Jones, their current president and treasurer, who for 49 years has held many roles. He began his playing days in the late 1960s, went on to coach the club, held several key posts, however it was when he took over the role of Treasurer in 2004 that the clubs fortunes started to change, with a drive to improve the club facilities. In 2004 they managed to raise £90,000 to self-fund the re-fabrication of the clubhouse, this was soon followed in 2006 by raising an additional £32,000 to complete the work adding new changing rooms and a new club house roof. In 2007 the club managed to secure £15,000 to build a new gym and refurbish more changing rooms, with all the building works completed, it was mow time to focus on the grounds, with a programme to improve the pitches and install some new floodlights. The first phase began with a small self-funding budget of £8000 to refurbish the first team pitch floodlights in 2008. Away from the club, Glyn runs his own landscape gardening business, with a very much hands on role, this affinity with grounds maintenance was one of reasons he wanted to oversee the larger project of improving the club’s four pitches/training areas. The pitches at Sundorne have always been prone to drainage problems, due to their heavy soil make up, especially during the winter months, tasked with marking the pitches every week, Glyn knew only too well the work required and the significant investment that would be needed to improve the four pitches. 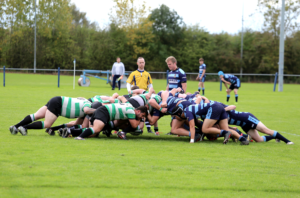 It was then a case of the club putting together a number of bids over several years, applying for appropriate funding via the RFU and Sport England. In 2006/7 season the club acquired a grant of £65.000 from the RFU to primary drain the training pitch, the following year the club self-funded £15,000 to pay for secondary drainage (sand bands) for the training pitch. This was soon followed up with another successful bid for £120,000 to fully drain (primary/ secondary drainage) and install a new set of floodlights on the second team pitch in 2012/13. Finally, in 2014/15 the club managed to get a further £145,000, with the club having to find 15% (£15,000) to undertake the installation of a primary and secondary drainage system to the first team pitch along with a brand new set of floodlights. 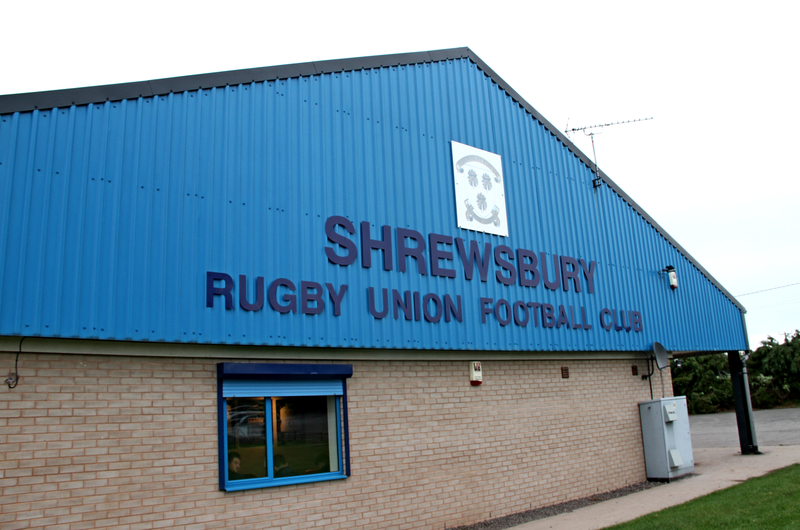 In total the club has managed to invest over £500,000 on both the clubhouse and grounds in the last 13 years and the net result has been the transformation of Shrewsbury Rugby Club. With all the work complete it was now a case of ensuring an ongoing maintenance programme was implemented to insure the pitches remain playable and fit for purpose, especially when several senior teams and a large junior section using the pitches on most days of the week. In fact, Glyn has taken on the role of maintaining the pitches himself. Glyn has put out the mowing of the pitches to the local council, who come in on a weekly basis, usually Wednesdays and cut all the main playing areas with an 18 ft wide Major rotary deck maintaining a height of cut of 75mm. He also gets the council to come in and aerate the pitches a couple of times a year using a combination of Vertidrain and Linear aerators. He also gets the pitches sprayed with a selective weed killer, the marking out of the pitches is done by Glyn and Derrick on Thursday or Fridays using a spray jet line marker along with some pedestrian mowing/strimming of some amenity grass areas around the club house. As for end of season renovations, it often depends on how much money there is left, but generally they allow enough to top dress all four pitches with 120 tonnes of sand and overseed any worn areas. In total the club spend around £25,000 on annual maintenance work, most if not all this money comes from the generosity of local sponsors and any fundraising events. It goes without saying these community clubs would not survive without the commitment and guile of these dedicated members. Having seen for myself at close hand the work Glyn has achieved over the last 20-plus years at Shrewsbury RFC is beyond belief. He and the rest of the dedicated members at Shrewsbury should without doubt be congratulated on these major achievements. I just hope this next generation of players respect and enjoy what must be one of the best run clubs in Shropshire. Like all good clubs Shrewsbury can trace its origins to a bar, in this case the now demolished George Hotel. In 1908 a casual conversation between Freddie Richards, Bill Jones and a man called Deakin led to the formation of the club and a first fixture at Sutton (now Sutton Road) against Stafford. The pitch was rented from a farmer and attendances at the first game were sufficient to buy goal posts, jerseys and balls; how times have changed! The result of that first match remains a mystery, but obviously it was enjoyed by all who participated. The ground had moved to Upper Road Meole Brace with the headquarters moving from various hostelry to hostelry dependant on the behaviour of the members and friendliness of the landlord. After the second World War a subsequent President Geoff Warn reformed the club with himself as Secretary and T. Gordon Hector as President. Matches were played at Longden Road or Shrewsbury School, until the club moved to the West Midlands Showground in the 1946/47 season. Bert Williams who was originally captain in 1938/39 then re-took over the Captaincy until 1955/56and followed Mr Hector as President in the early 1960s. Then came the the highly successful years of the sixties during which time the 1st XV were virtually unbeatable. The playing success led to a very good club fund raising, through the Shrewsbury Amateur Sporting Guild run by Arthur Richardson, enabling the purchase of the present ground at Sundorne Castle in 1964. The early-1970s saw the club going through indifferent times with the loss of some familiar fixtures and sadly the death of Sir Derek Capper in his first year as President. In the 1980s the club enjoyed further success under the captaincy of first Chris Pittaway and then Keith Faulkner. After some lacklustre years in the 1990s the club became regenerated with the enthusiasm of former coach and Chairman Alan Davies, Secretary Graham Jackson and Chairman David Brown. This work has been continued by Glyn Jones Chairman/Treasurer and Gary Dean, Secretary, who together with others have seen through the financing and construction of extensions to the club house and the improvement of facilities which have recently seen the addition of a gym. The club can now boast of a large and ever increasing mini and junior section, under the Chairmanship of Grant Mckelvie, assisted by Sam McKelvie, with James and Sarah Ballantyne.